Nightclubbing (Grace Jones and Iggy Pop, live, 2009). It’s also a work of anticipation—Bowie and Pop were planning to live in West Berlin, to play the artist, to hang out in cafes and clubs, and (hopefully) to kick their various addictions, but they didn’t move there until fall 1976. So the West Berlin clubland of the song is largely imaginary, its sounds and imagery imported (they told the guitarist Phil Palmer to craft a solo by imagining walking down Wardour Street in London, hearing music blasting from various clubs). Before funtime, there was another album to make. Recorded (most likely) in August 1976 at Musicland, Munich. Covered by the Human League in 1980 and Grace Jones in 1981, and probably best known for being on the Trainspotting soundtrack. Trent Reznor sampled the bass drum for “Closer,” while the likes of Marilyn Manson owe their entire careers to it. 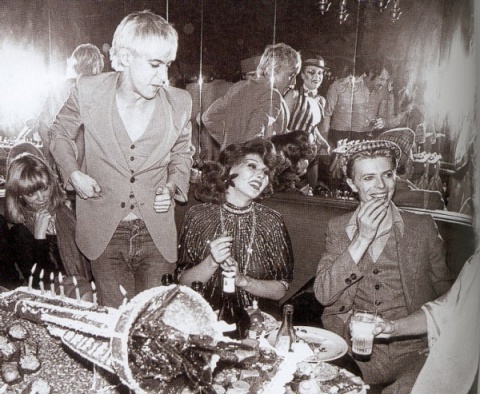 Top: Bowie and Iggy sampling the Berlin nightlife, ca. 1977 (or 1931).